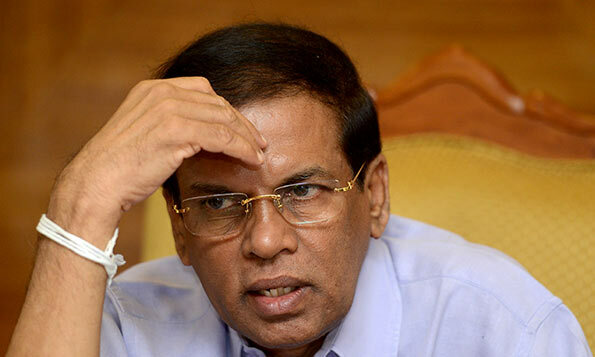 President Maithripala Sirisena has failed to secure crucial support of the breakaway faction of his Sri Lanka Freedom Party (SLFP) dimming prospects of a snap presidential election, according to seniors on both sides. Sirisena had hoped to seek re-election no sooner he completed four out of his five-year term on January 9, but with no support forthcoming from the Sri Lanka Podujana Party (SLPP) he has had to look for a plan B, political sources said. SLFP sources said the bonhomie between Sirisena and his erstwhile enemy Mahinda Rajapaksa was waning after the Supreme Court effectively dismantled the unlawful government formed by the pair on October 26. SLPP insiders now openly admit that the Sirisena-led coup against Prime Minister Ranil Wickremesinghe and his United National Party (UNP) had damaged their prospects at a time when they were on the ascendency. The local council elections in February last year demonstrated that the SLPP had taken over the SLFP vote base and emerged the largest single group pushing Wickremesinghe’s UNP to second place. But the Sirisena-Rajapaksa power grab, which the UNP described as a coup, had hurt the popularity of the SLPP and damaged its credibility after it was seen colluding with Sirisena, their former hate symbol. “We will not be able to carry our rank and file if we are to support Sirisena,” an SLPP source said. “Already we have paid a heavy price after October 26.” He was referring to Mahinda Rajapaksa, the de facto leader of the SLPP, forming the short-lived government with Sirisena. As it became clearer that the SLPP will not support Sirisena, he moved last week to restructure the electoral level organisers of the SLFP to strengthen his hold on what is left of the party. He was even trying to make overtures to the UNP. The latest cabinet meeting saw the president adopting a friendly disposition towards his UNP cabinet ministers. “We noticed a marked change in the President at the last cabinet meeting,” a senior minister said. Within the SLPP hierarchy, they are clear about fielding their own candidate who will inevitably challenge Sirisena should he decide to seek re-election. The SLPP candidate is most likely to be a Rajapaksa sibling with Chamal, Basil and Gotabhaya being mentioned as credible prospects. However, both Basil and Gotabhaya are not eligible because both of them are dual citizens of Sri Lanka and the United States. Neither Basil nor Gotabhaya are yet to renounce their US citizenship to be eligible to contest presidential elections. While the SLPP grapples with a candidate, the UNP too is faced with serious internal strife in choosing its contender. Prime Minister Ranil Wickremesinghe is expected to offer himself for election, but he faces opposition from several members of the party leadership who want a new face. Sajith Premadasa is mentioned as a prospective candidate. However, Speaker Karu Jayasuriya is emerging as a strong UNP prospect after his role last year in resisting what the Supreme Court eventually held were unconstitutional moves of the President. whos gonna vote this idiot again?? It will be a crowded house at the next Presidential Elections.